When I was a kid, I liked ghost stories. My father had some books about white ladies and he told me about castles which have their own private ghosts. He didn’t believe in them. I think he just wanted to make my world a bit richer, just like I tell my kids how their grandparents had to run from dinosaurs when going to school and how their father saved me from a dragon. Now I don’t believe in ghosts as white sheaths moving softly through walls. But I do believe that extreme sadness, pain and anguish can leave behind some kind of remnants that we – or some of us at least – can feel. Now, Jim Butcher is not this subtle. When he lets Harry Dresden go up against ghosts, he doesn’t just find some whimpy moaning white lady to pit him against. He of course creates the worst kind of ghost imaginable and lets this ghost have the most powerful helpers – and then he lets Harry, poor messed-up Harry, face off with these and takes us along for the ride. Now it’s not like Harry hasn’t got any help. Taking a back seat in this story are Harry’s normal helpers such as Karrin Murphy, a police officer from Special Investigations and also to some extent Susan Rodriquez, Dresden’s girlfriend. But they are put on the back burner to make room for interesting new characters such as Michael, a Knight of the Cross, and his family. Now Michael comes with a special connection to God and a magnificent sword and while constantly lecturing Dresden on how to be a decent person and a better man, he knows how to handle himself when trouble comes around. The intrigue in this book also allows us to delve into the Nevernever for the first time – an experience which is not altogether pleasant for our dear Harry. It also allows us to experience the Vampire courts more intimately than earlier – again not altogether pleasant for Harry. It also introduces faeries, especially Harry’s godmother Lea. If you ask me to say exactly why I like these books, I’m not quite able to get you an answer. I can give you all the normal reasons – it’s a thrilling exciting read with an interesting main character and it’s just the right thing to loose yourself in. But so is a lot of books. I haven’t yet pinpointed what it is that so far makes me enjoy these books. But I do enjoy them and I guess I’ll keep reading ’till I can find out what it is that attract me about Harry Dresden. Other than he is a cool, but not too cool, wizard living in Chicago trying hard not to destroy any and every modern technology he gets remotely close to while attempting to help ordinary people exposed to supernatural situations and creatures while trying to have a somewhat normal relationship with his girlfriend. 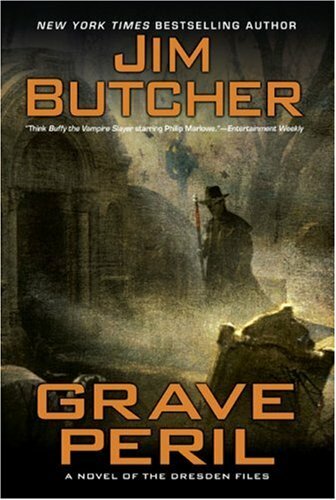 This entry was posted in Books, Fantasy, Kindle, Reviews and tagged books, Grave Peril, Harry Dresden, Jim Butcher, literature, review, the dresden files by christinasr. Bookmark the permalink. I keep picking these up in library and looking at them and then putting them down again. However, they do attract me in the same way as Ben Aaronovitch’s books do so perhaps the time is coming when I’ll bring one home. Are they best read in order? I have some fantasy series I keep picking up and wondering about whether I want to read or not with gorgeous covers that just keep pulling at me so I know how you feel.